1. Including tension control which can keep the cloth smooth and look beautiful. 2. Suitable for all kinds of PVC and PU leather cows leather and pig's leather could be pleating with optional parts. 3. 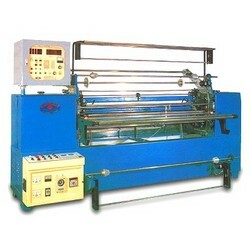 The automatic cloth rolling can save manpower with high productivity. 4. The temperature control system is adopted and oil windlass, which can by digital display control the temperature of pleating and pressing of the cloth precisely. 5. The machine has 640 sections and can pleat into 640 kinds of designs. 6. When you know the function key, you can directly input the design you know without restricting by the tape. 7. Can learn how to operate within 20minutes different kinds of designs can be finished in 30 seconds. 8. Only one kind of blabe is needed for the neweat design. 9. Using the high quality insert-type computer IC print circuit board, easy to maintain and change. 10. Using the high Photo-electricity control and pleating one design in one time. 11. Suitable for al kinds of working condition, not necessary to install air-conditioner in the factory.